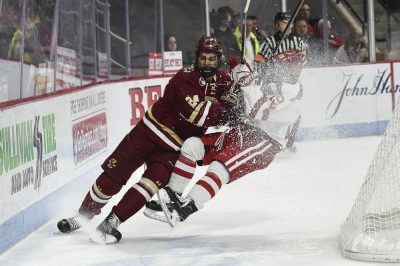 Friday night’s Boston University versus Boston College Hockey East semifinal is, quite frankly, the biggest game in over a decade featuring the two Commonwealth Avenue schools. The road to the NCAA tournament will eventually have to go through either Northeastern University or Providence College, but first, the B-Line is TD Garden bound. A true elimination game, for both teams, is something the BU-BC rivalry hasn’t experienced since 2006. Many times over the past few years in this rivalry, one team has been playing for its life, but not both. In fact, this scenario is far less common than you would think for a rivalry that dates back to Wilson Administration (1917). All in all, this will be the sixth time BU and BC have gone into a playoff game where both teams’ seasons are in peril. The 2006 meeting was in the Northeast Regional final with a trip to the Frozen Four in Milwaukee, Wisconsin on the line. This was the sixth time the two schools played that year, with BU owning a 4-1-0 record against the Eagles entering that contest, which included wins in the Beanpot final and Hockey East championship game. BC trounced BU 5-0 in Worcester to advance to the Frozen Four, where BC fell 2-1 to the University of Wisconsin-Madison in the title game. 2006 was the first such elimination game since a three-year run in the late ‘70s. 1976 and 1977 saw the Terriers and Eagles paired together in the ECAC quarterfinals. Back then, the quarterfinals were a one-game playoff and the NCAA tournament consisted of just four teams, meaning both school’s seasons were over with a loss. In both ’76 and ’77, BU advanced past the Eagles en route to making the ECAC championship. Then there was 1978. Despite losing in the ECAC semifinals to Providence, BU still qualified for the NCAA tournament. BC won the ECAC and was an automatic qualifier. Both BU and BC rolled through their competition on a collision course to the national title game. There, BU upended BC 5-3 in the Providence Civic Center to claim their third national championship. Before the momentous 1978 national championship game, the only prior example of this rare elimination between game BU and BC was 1949. Even then, it’s not exactly clear if this was, in fact, an elimination game for both. BU was 13-7 and advanced to the New England Ice Hockey League (NEIHL) championship to face 19-1 Boston College in the final. There were no automatic qualifiers at this time, and 1949 was just the second season the NCAA sponsored a national hockey championship tournament. The Eagles won the NEIHL championship game 7-2 over the Terriers and eventually won their first national title a few weeks later in Colorado Springs over Dartmouth College. If BU won the NEIHL, there is no saying it would have qualified for the NCAA tournament, as league champions had no bearing on the selection process at that time, but it’s fun to look back. So that’s it. Just four, maybe five, true elimination games for BU and BC. Also, if you have been keeping score, BU leads this death match 3-1, possibly 3-2 if you’re counting 1949. Outside of the real elimination games, there have been a number of must-win games for one school to keep their NCAA tournament dreams alive. Since Hockey East started in 1984, in the five previous semifinals, three were must-win elimination games for one team. The first such example was 2009. BU was already assured a No. 1 seed entering the Hockey East tournament, but BC was a ways back in the PairWise Ranking. Behind three goals in a 44-second span in the third period, the Terriers beat the Eagles 3-2, crushing BC’s NCAA hopes. This was the last time either BU or BC ended the other’s season. In 2013, BU was the one who needed to win to prolong its season. The Terriers cruised to a 6-3 victory over the Eagles after falling behind 2-0 early on. BU fell to the University of Massachusetts Lowell 1-0 the following night, and its season concluded just two slots outside the NCAA tournament. Finally, last year, the Terriers had to beat the Eagles to stave off elimination and keep their NCAA hopes alive, despite winning a share of the regular season title. BC won 3-2, but again fell victim to Lowell in the championship game and was left out of the national tournament. Get excited everyone — and don’t let the early time slot fool you. This is the most important BU-BC game in over a decade, and this true elimination death match doesn’t happen every year. Not even close.